The Government of Colombia – along with its largest cocoa company, Casa Luker, and the members of the National Cocoa Federation – has committed to eliminate deforestation from the country’s cocoa supply chain by 2020. The commitment will be supported by the World Resources Institute (WRI) and the Sustainable Trade Initiative (IDH). Colombia joined the Cocoa and Forests Initiative, a global effort to ensure deforestation-free cocoa. The Governments of Ghana and Côte d’Ivoire, responsible for 60 percent of the world’s cocoa, were the first two governments to sign and implement the agreement in 2017. Today, Colombia becomes the first country from Latin America to sign up to the principles of the Initiative, which will be called the ’ Cocoa, Forests and Peace Initiative’, in honour of cocoa’s role in advancing the historic peace process by providing rural employment to farmers and communities previously involved in the conflict. The Colombian cocoa sector is growing rapidly. The crop has been identified as a priority for Colombian agricultural growth, both for domestic consumption and international export. The bulk of Colombia’s cocoa production has the characteristics of ’Fino de Aroma’ cocoa, a classification much-prized in the international market. Colombia’s rates of deforestation have increased rapidly since the conclusion of the peace process, as remote areas of the countryside – once off-limits – have seen rapid agricultural and livestock expansion, land speculation and infrastructure development. Recent data from Global Forest Watch and the National Meteorological Institute (IDEAM) show Colombia saw a 46 percent increase in tree cover loss in 2017, which was double the average loss from 2001-’15, but the country is taking significant steps to stop this trend. The government cancelled a major highway project connecting Venezuela and Ecuador, destroyed several illegal roads, and launched the “Green Belt” initiative to protect and restore a 9.2-million-hectare forest corridor. To date, cocoa has not been a significant driver of deforestation in Colombia, and the Initiative is intended to ensure that this continues. 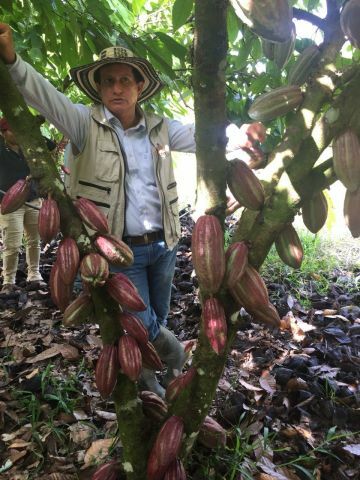 Colombia views cocoa as a strategic crop with which to close the forest frontier and restore degraded agricultural lands through agroforestry and silvopastoral systems comprising cocoa, livestock and trees. Colombia has pledged to restore 1 million hectares of degraded land in its National Development Plan and under Initiative 20x20, a regional effort to change the dynamics of land degradation in Latin America and the Caribbean. Restoration not only contributes to climate change mitigation, but also brings a wide range of benefits including rural welfare and employment, enhanced food security, soil and water conservation, biodiversity protection and climate change resilience. Colombia has strong ambitions to grow its cocoa export market, with cocoa identified as one of the country’s priority crops in its ’Colombia Siembra’ agricultural growth strategy, as well as its engagement in the World Economic Forum’s New Vision for Agriculture (whose secretariat is hosted by The Sustainable Trade Initiative – IDH – in Colombia). The lead signing company, Casa Luker, is responsible for purchasing the majority of Colombia’s national cocoa production. Wendy Arenas, Special Advisor to the Presidential Agency for the Post-Conflict, Government of Colombia, said: ”Cocoa is a crop with exceptional qualities for the post-conflict. Agroforestry with cocoa helps the process of restoration and recuperation of degraded areas in critical zones for the ecological well-being of the country. Its potential for growth in the national and international market means this supply chain faces a golden opportunity. This is what we have seen in regions of the country such as Arauca, Guaviare, Putumayo, Nariño and others. It is for this reason that we have promoted this agreement as a commitment from the country which we hope will be recognized by international markets“. Andrew Steer, CEO, World Resources Institute, said: ”We are delighted that Colombia has joined the Cocoa and Forests Initiative. This is precisely the kind of public-private partnership that will help deliver on Colombia’s peace process and the sustainable development goals. We stand ready to accompany the Government to deliver on this vision".